The distance in this case is 55 miles. We are ready to start our trip on #74, engine #3034, an L-3, 4-8-2 with the elephant ears, as far as Wabash. The last time we were pulling out of the yards. The brakeman climbs aboard and Bill keeps a speed of about 10mph which allows the conductor to catch the cab and not give him gorilla arms. The switches are hand thrown, all three must be realigned for straight track. This is curved track and we cannot see the rear end for a signal. There is a 69 car mark north of the yards, a post, building or something that doesn't move. At this time cars are pretty much short and a little longer. By this I mean 40ft. and as a rule the longest 50ft. We figured 3 cars to the distance between telephone poles. That way, pulling by any given point and knowing how many cars you had, gave you an idea where the cab was located. 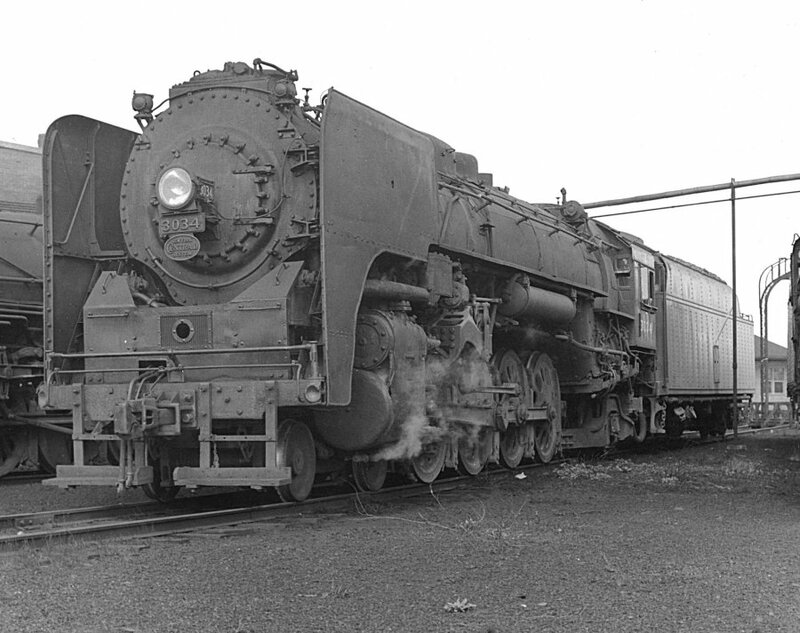 We will run under automatic block for about 4 miles and then by manual block to Wabash. Bill gives 2 blasts of the whistle and starts pulling out a little on the throttle. If we misjudged the train length, the rear end will pull the air. The gates at the PRR and the C.I. Railroads were both lined for us. As we come to the end of double track, which is on a curve and my vision is restricted, Bill gets about 5-7 lbs. of air in case the signal is red. The signal is clear but another short block is ahead where the B-line uptown main crosses at MY interlocking. The signal at MY is clear and Bill releases the air and as we move along at 15mph, I am using the blower slightly to keep the fire bright because the engine cannot be worked. The lay of the track is level to slightly downhill and then around a curve down a 1.1% downgrade for 3 city blocks. As we start around the curve Bill slips another 5-7 lbs. of brake and widens on the throttle a little. The next signal is clear. When using the air train line leakage comes in effect, Bill moves the brake handle to running position for about the count of 6 and then back to the lap position. This is the way we controlled the total amount of air reduced from the train line. Knowing where his train is at in the game plan, you must be aware of this at all times when handling a train. Bill releases the air and starts coming out on the throttle for the approaching 1.1% grade up to Dow interlocking which also is around a curve to the left, that the engineer will be blind to, and will depend on the fireman to relay the signal indication. The signal is clear and Bill starts coming out on the throttle. It is level and about 9 miles to Alexandria. Bill soon gets the speed up to 40mph, the legal speed. As we approach Alex and about 80 cars from the NKP interlocking, Bill places the throttle in about half open position and reduces the train line about 7 lbs. Riding this set, you can feel the brakes starting to apply. About 50 cars from the signal we start down a 1% grade and a small curve to the right. This curve gives a depth perception problem and you have to keep on your toes when stopping at the signal. Bill places the brake valve in running position for the count of 4 and back into lap, controlling the train line leakage. Easing off of the throttle again, he lets the engine pull against the train with the brakes applied coming to a stop 40 ft. from the signal. The brakeman drops off, walks to the signal, places his key in the little box, turns it and the signal goes to a clear indication. Bill releases the brakes, whistles off and we head north, next stop Marion. While we were stopped I looked at my fire and it looked good, about 5 in. thick with a little splash on the throat sheet and a small clinker at the rear, which I pulled under the distributing plate with the short clinker hook and I am ready. 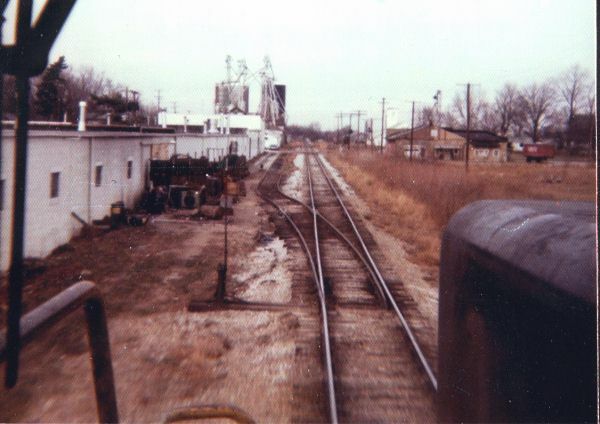 We have a clear block at the Alex depot that will take us to Summitville, another 5 miles away. Bill is giving the engine a good workout up the 1.2% grade leaving Alex. This grade is about 2 miles long and then drops downhill for a mile and we will be up to the 40mph again. As we come around the curve south of Summitville, I give a thumb up saying clear block. Most of the towns south of Wabash lay in a bowl because the towns were built along a stream for a water supply for the mills. Most streams run from northeast to southwest, so you are always crossing the water flow on a north south railroad. Approaching Fairmount, remember we have a meet with the local and he will be in the clear. We can see the signal and it is clear. We keep on charging. How do we know the local, extra 6323 south, is in the clear? In manual block the rules will not let opposing trains in the same block. The meet was for Fairmount and no where else and the clear tells us that the local is there. Another 5 miles and Jonesboro with a 30mph through the curves that start at the south edge of town. The track makes an S curve with the depot in the middle of the curves. You have to see the block signal through the trees and housetops. As we come into town the brakeman and I are looking, we spot it clear and a thumb up.